Soaked in water from a wave, smiling, surging with adrenaline, I raised my arms and shouted into the sky. An eddy spun me around and I stared back at the rapid, laughing, not thinking. Words spilled out of my mouth, loud and full. “Did you hang on, Franks?” I yelled. They had, of course. I twisted around and caught two flashes of pink strapped to the stern with my eyes, but the words shook the air, rude and loud. They grated against the roar of water. I hadn’t seen anyone since I entered Quetico. Not a canoe in the distance. Not smoke from a campsite. Nothing for three days. Not even footprints. I stopped shouting. Stopped laughing. I listened. The rush of the rapid filled the air. Water moved over rock. Leaves rustled. A bird called out. Another answered. I drifted. Silent. Penitent. The world forgave me. Something happens when you are alone for so long. You stop talking. You stop making noise. You listen. You turn your head. Your ears flick toward sound. It’s like standing in the forest at night. At first you see nothing. It’s all black. But you wait. You stand there with your eyes open. Shadows emerge. Lines rise between black and grey. Shapes color in. Your eyes widen. Pupils expand. You start to see again. Tree trunks, branches, leaves. You could walk. You could run even. You wonder how you ever thought it was dark. That happens to all your senses when you’re alone. You notice the texture of the ground. How fallen leaves and fallen needles feel different under your feet, different with dirt, roots, or rocks beneath them. The air smells. Stale. Fresh. Wet. A hint of smoke. The colored leaves become more than bright. You see patterns. Cold patches that are further along. Pockets of color that face the north wind. And noise fills the silence. You hear everything. The birds. A beaver sliding into the water. The wind in the trees. The faint rush of current around far bends. Loons calling in the distance. Water against rocks. The silence. You hear the silence. The perfect silence. When everything is still and you don’t dare whisper out of respect. It is loud. Three days without seeing anyone. Three days from the last roar of engines fading on the highway. Three days to cross Quetico. I slipped out of the park’s western boundary and into Lac la Croix, Lake of the Cross, named that after Jesuit Missionaries or because it’s where paths cross, where the Grand Portage and Kaministiquia Routes converge and the Namakan and Loon Rivers drain away. No one can say for sure. I’ve been on this lake before. I remember two portages to get into it. They had marine railroads built on them to haul powerboats over from Namakan. $17 a run. I remember shouldering the kayak for the first time and feeling the weight twist my back. I remember watching a family trip down the rocky path as their boat rolled past on a pair of steel tracks. “Must the whole world be conquered,” I thought. The lake stood flat and beautiful. Poplar glowed in a fire of yellow along the north shore. The leaves shimmered off the water, reflecting in the mirrored surface. The air stood silent. Nothing made a sound. Then it came, the grinding whine of a motor, fired up and roaring. Fishin’ spots not good enough, someone said. Try another, someone said. Moving just to move, shattering the still air from miles off, searing the silence like high beams sear your eyes in the dark of night. Three days, just three slow days from one side to the other, from the highway to the shrill whine of a motor boat on Lac la Croix, man and machines pressing to the edge, chewing, gnawing, circling like sharks. The motor droned and disappeared. Stopped at the next hole. The world went silent again. I looked out. I blinked. I listened. But it was gone. The magic was gone, burnt away in the whine of a motor. Posted in Angle to Key WestTagged Angle to Key West, motors, Quetico, wildernessBookmark the permalink. Given today’s world and the changes in the human environment the last 3,000 years, it is amazing how underused our senses are. Beautifully said D. And I think the magic is always there. Sometimes it is harder to sense for lots of reasons but the key is not the roaring boat but our inner perspective. That lake, that forest, that poplar, that moon, that shimmering leaf in the water did not disappear with the engine roar. It was just a bit harder to see and feel. 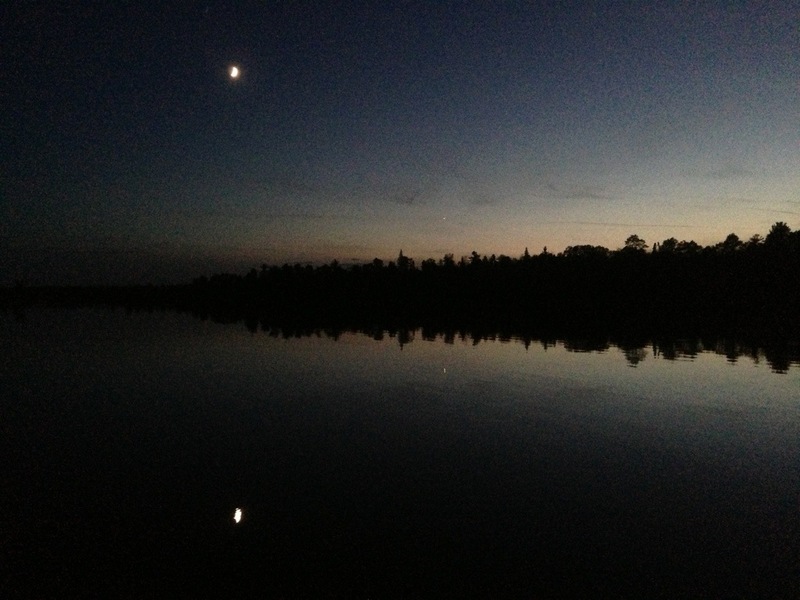 That’s one of the reasons I like the Boundary Waters. No power boats. Amen. I wish all protected waters refused to allow power boats. “And noise fills the silence.” I relish every word in this entry. It validates my preference for hiking alone and being, as much as possible, closer to the natural world.